A remote-controlled robot that will probe the debris inside the No. 1 reactor could start operations as early as this summer. There is a new robot that will be used to probe the inside of the No. 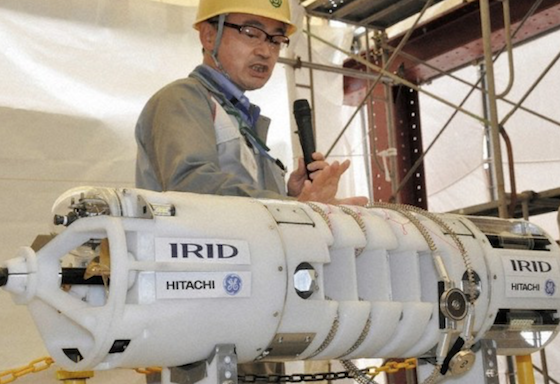 1 reactor at Fukushima Daiichi Nuclear Power Station, which experienced a meltdown in March 2011, said officials at the International Research Institute for Nuclear Decommissioning (IRID). The robot, created by GE Hitachi Nuclear Energy (GEH), will make the first ever attempt to collect nuclear fuel debris at the plant, beginning as early as this summer. The No. 1 reactor suffered far more damage than the No. 2 and No. 3 reactors, and most of its nuclear fuel is believed to have turned into debris at the bottom of the containment vessel enveloping the reactor. Because the containment vessel is filled with cooling water, the robot was designed to work underwater. The robot, which has a diameter of 25 centimeters and is approximately 110 centimeters in length, will allow for visual confirmation of the internal state of the containment vessel. GEH will be developing six types of robots for purposes such as collection of debris samples and measuring radiation levels, and measuring distribution of debris on the bottom of the containment vessel. In a probe of the No. 2 reactor in February, it was confirmed a portion of the debris could be taken out. The government and Fukushima Daiichi Nuclear Power Station operator Tokyo Electric Power Co. (TEPCO) are set to decide by fiscal 2019 which, among the No. 1, 2 and 3 reactors, they will begin full-fledged removal of debris at, and begin removal as early as 2021.